17 People Died In The Parkland Shooting. Here Are Their Names : The Two-Way Through their grief, families and friends of the victims at Marjory Stoneman Douglas High School told the stories of those who were killed on Wednesday. 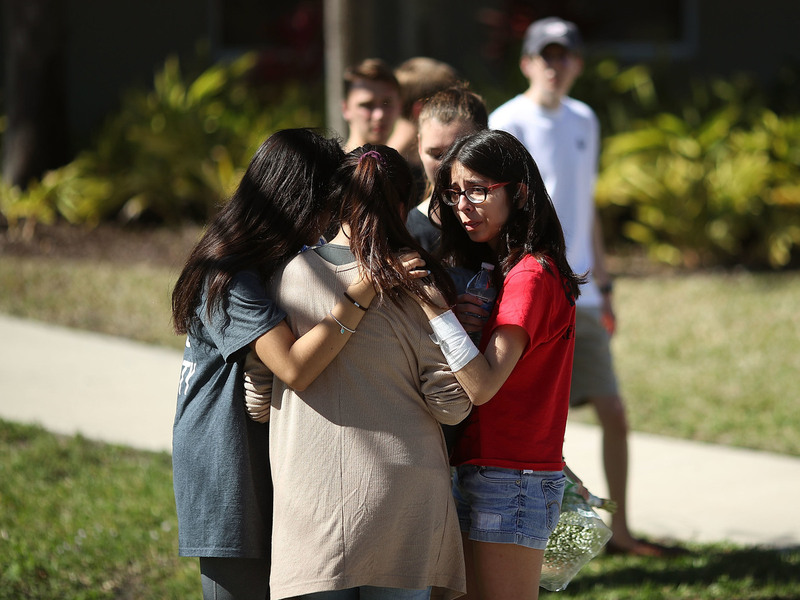 Students of Marjory Stoneman Douglas High School gather on Thursday in Parkland, Fla. Fourteen students and three staff members were killed in a shooting at the school on Wednesday. In the shooting Wednesday at Marjory Stoneman Douglas High School, 17 people were killed. Three were on the staff as coaches or teachers; 14 were students. On Thursday afternoon, the Broward Sheriff's Office identified them. Alyssa was 14. In a Facebook post, her mother said Alyssa was a talented soccer player and creative writer and had an amazing personality, the Sun-Sentinel reports. She was remembered at a funeral service and burial this morning in North Lauderdale, Fla. Some 400 people gathered for the service, spilling out onto the sidewalk, the Sun-Sentinel reported. "I wish I could have taken those bullets for you, Alyssa," her mother Lori Alhadeff said at the funeral, according to the Miami Herald. "I would have protected you." "This has changed our entire community forever," said Rabbi Goodnick at the beginning of the service, the Herald reported. "It's not just a loss to our community. It's a loss to humanity as a whole. Parents aren't supposed to send their child to school, like so many of you did today, thinking that they may never come home." At a vigil on Thursday night, teammate Madison Ciccone said that Alyssa had started the season on the J.V. soccer team, but by the end had been called up to varsity. "She was ecstatic [when she was called up]," Ciccone told the Sun-Sentinel. "It's an amazing feeling being a freshman on varsity." The summer camp she attended in northern Georgia also shared the news of her death. "May Alyssa's memory forever be for a blessing," Camp Coleman posted. Yesterday, Lori Alhadeff issued an emotional challenge to President Trump. "I just spent the last two hours putting the funeral arrangements for my daughter's funeral, who's 14," Lori Alhadeff said in an interview on CNN. "President Trump, please do something. Do something! Action! We need it now! These kids need safety now!" Beigel, 35, was a geography teacher and the school's cross-country coach. "Stoneman Douglas student Kelsey Friend said in an interview with ABC's Good Morning America that Beigel saved her life.
" 'He was in the doorway and the door was still open and the shooter probably didn't know we were in there because he was lying on the floor. If the shooter had come in the room, I probably wouldn't be [alive].' "
"Mr. Beigel was my hero, and he still forever will be my hero," Friend told CNN. "I will never forget the actions that he took for me and for fellow students in the classroom. The List Of School Shootings Just Keeps Growing. Do We Still Feel Anything? "If his family is watching this," she said through tears, "please know that your son or your brother was an amazing person and I'm alive today because of him. Thank you for bringing and having this amazing person in life, and giving him the power to be stronger than I could have ever been. ... I will not let this shooting go down as another one." Martin, 14, was a freshman at the school, according to the Miami Herald. "Words can not describe my pain," his brother Miguel wrote on Instragram. "I love brother Martin you'll be missed buddy. I know you're in a better place. Duques forever man I love you junior!!! R.I.P Martin Duque!" In a GoFundMe solicitation to raise funds for his brother's funeral, Miguel wrote, "He was a very funny kid, outgoing and sometimes really quiet. He was sweet and caring and loved by all his family. Most of all he was my baby brother. My family and I have no words to describe the event that has happened on this date, all my prayers to the lost ones. My family and I will appreciate anything that we can get helped with. R.I.P Martin Duque." Nicholas, 17, was a senior at the school with Olympic ambitions. Andre Bailey, head coach at Dworet's swim club, told The Indianapolis Star that the swimmer made huge strides in his life in the last 18 months: working hard at school and in the pool. Nicholas had just earned an academic scholarship to the University of Indianapolis and had committed to its swim team in the fall. "Nicholas was a team captain known as the 'swim daddy' for the way he helped teammates train and practice.
" 'Everybody loved him,' Bailey said." The Miami Herald reports that Nicholas was just making a name for himself as a state-ranked swimmer. Dworet was one of the top short-distance high school swimmers in Broward County over the past two years and had success at the state level as well. He finished fifth in November at the Class 4A state swimming and diving championships in the 100-yard freestyle in a personal-best time of 46.53 seconds, according to his College Swimming profile. The Miami Herald named him as a third-team All-County swimmer this season. "'He dreamed of making the Olympic swim team and going to the 2020 Olympics in Tokyo," the Dworet family wrote in a statement posted to father Mitchell Dworet's Facebook page Friday morning. "He believed he could accomplish anything as long as he tried his best.'" Feis, 37, graduated from Douglas High School in 1999 and had been an assistant football coach at the school since 2002, the ­Sun-Sentinel reported. He had worked as a security guard at the school for at least eight years. Now he's being heralded as a hero. He reportedly died from wounds he sustained while shielding students from bullets. "He was a great guy," sophomore Douglas lineman Gage Gaynor told the Sun-Sentinel. "Everyone loved him. Shame he had to go like this. Always gave his all to making us better. Definitely learned a lot from him." When he heard the gunshots, Feis — along with Chris Hixon — raced to the scene in a golfcart. He told football coach Willis May, "That was no firecracker." Broward Sheriff Scott Israel told the Miami Herald that the stories about Feis' response fit his character. "'I don't know about the incident yet or what actually his performance was, but I know Aaron personally. I coached with him. My two boys played for him,'" Israel said. "'I don't know when Aaron's funeral is, I don't know how many adults are going to go, but you'll get 2,000 kids there. The kids in this community loved him. They adored him. He was a phenomenal man.'" Feis is survived by his wife, Melissa, and a young daughter. "My heart is broken," her father, Fred Guttenberg, wrote on Facebook, according to the Miami Herald. "Yesterday, Jennifer Bloom Guttenberg and I lost our baby girl to a violent shooting at her school. We lost our daughter and my son Jesse Guttenberg lost his sister. I am broken as I write this trying to figure out how my family get's through this. ... Hugs to all and hold your children tight." Speaking at a candlelight vigil held Thursday night, Fred Guttenberg spoke of Jamie in a moving tribute: "I sent her to school yesterday, and she was supposed to be safe," he said choking back tears. "My job is to protect my children, and I sent my kid to school." Hixon, 49, was fatally injured after he raced to the scene of the shooting to try to help students, the school's head football coach told NPR. Hixon was the wrestling coach, along with his role as athletic director. "It's hard to be AD and a coach but he did it because he just loved it so much," says Willis May Jr. Hixon loved being with the students — "he'd get out there and wrestle with them." May described Hixon as a "great man" with a "great sense of humor" who loved his family. He added that Hixon was very proud of his military background. Last year, Hixon was named Broward County Athletic Association's athletic director of the year, the newspaper reports. Jason Stein, athletic director at neighboring Taravella High School, told the Sun-Sentinal that Hixon was survived by his wife and a son with special needs. "It is devastating," Stein told the newspaper. "His son was with him everywhere. Chris epitomized what an athletic director was all about." Luke, 15, was a freshman who played basketball and was an NBA fan — and he was quiet but happy, his cousin Grant Cox told The New York Times. "I know Luke loved his family," Cox said. "He had a huge heart." Luke's aunt, Joan Cox said her nephew was a loving, sweet person who "smiled all the time, according to the Miami Herald. She also said that Luke's parents, Gena and Thomas Hoyer searched local hospitals for their son before going to the law enforcement command center where they were informed he had died. He was the youngest of three children. Luke's funeral is scheduled for Feb. 19 at Church of the Glades in Coral Springs. Cara was 14 and loved the beach, according to the Times. "We are absolutely gutted," her aunt, Lindsay Fontana, wrote in a Facebook post seen by the newspaper. "While your thoughts are appreciated, I beg you to DO SOMETHING. This should not have happened to our niece Cara and it cannot happen to other people's families." Gina was 14 and a member of the school marching band's winter guard, the Sun-Sentinel reports. Joaquin was 17. He moved with his family to the U.S. from Venezuela when he was 3, the Herald reports. Friends told the Times that he played basketball in a city rec league and loved to write poetry. Alaina was 14, according to a Facebook post by her church in Coral Springs. It said that another member of the church had been shot twice but was expected to recover. "It is impossible to sum up all that Alaina was, and meant, to her family & friends," the family wrote in a statement to the Herald. "Alaina was a vibrant and determined young woman, loved by all who knew her." She was in the JROTC and helped with a Church of Jesus Christ of Latter-day Saints cleanup of the Florida Keys after Hurricane Irma, the statement said. Meadow, 18, was a senior who planned to attend Lynn University in Boca Raton, Fla., in the fall, The Herald reports. "Everyone should know how great she was," her cousin Jake Maisner told the Sun-Sentinel. "She was a beautiful girl, inside and out." More than 1,000 people attended her funeral including Gov. Rick Scott, U.S. Reps. Ted Deutch and Debbie Wasserman Schultz, and County Commissioner Michael Udine. Meadow's father yelled in anger at the accused killer at the funeral service held at the Temple K'ol Tikva in Parkland, the Associated Press reports. "You killed my kid," he told the congregation at the funeral. "'My kid is dead' goes through my head all day and all night. I keep hearing it over and over." "This is just unimaginable to think I will never see my princess again," her father added. "This piece of s--- killed my kid, and I wasn't able to do anything about it," as quoted by the Sun-Sentinel. Pollack was the youngest child in her immediate family and of 10 grandchildren, family members told the Sun-Sentinel. Helena was 17 and headed for college next year, according to her family. "My family lost an absolutely beautiful member today, due to a senseless school shooting," her relative Curtis Page said in a Facebook post. "Helena was a smart, kind hearted, and thoughtful person. She was deeply loved and loved others even more so. Though she was somewhat reserved, she had a relentless motivation towards her academic studies, and her soft warm demeanor brought the best out in all who knew her," he added. Alex, 14, played trombone in the marching band, the Times reports. His father told the Times that he was "a sweetheart of a kid" who "just wanted to do well and make his parents happy." His older brother, also a student at Douglas, survived the shooting. Carmen, 16, was a standout student. In September she was named a National Merit Scholarship semifinalist. Peter, 15, was in the [J]ROTC program, according to the Herald. His cousin told the newspaper that Peter was in study hall when the shooting began and that he had been holding a door so others could escape. His family reportedly owned a Chinese restaurant and was preparing to celebrate Chinese New Year on Thursday.